Focus more on growth and success, and less on the busy work. With Sage 50 Pro Accounting you get tools to manage and organize your business, so you can step back and see the big picture. Easy-to-use: Quickly setup so you can start billing customers and paying vendors, keeping track of your accounts. Safe: Your financial information is kept secure with basic module-level password protection and software that's installed locally. Efficient: Busy work is a breeze giving you more time to spend on your company's priorities. Support: Built in software tips, help at the screen level, and video guides let you learn just what you need to while you're doing it. 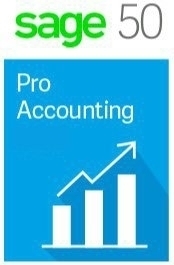 Whether you are just starting out or switching from a manual system, with Sage 50 Pro Accounting it�s quick and easy to set up the books for your business. From the start, you will have a better handle on your money and know where your business stands. Get automatic Sage 50 software updates and product enhancements with your current monthly or annual subscription3. Use Sage 50's Business Intelligence Reports to make fast, informed decisions. Sage 50 BI is a business analysis tool that lets you create customized reports using your real-time Sage software data in the familiar platform of Microsoft®Excel®. Payroll solutions are available as an integrated add-on. With Sage 50 Pro you can track hours, calculate employee deductions, stay current with ever-changing tax laws, print paychecks and stubs, generate W-2's, and everything else you need to keep up with your payroll responsibilities. These benefits and more are included with your purchase of Sage 50 Pro Accounting 2018 which comes with an auto-renewing Sage Business Care plan! Small business owners play many roles. For most, the roles of accountant or bookkeeper are the least favorite roles to play. The best accounting software doesn't just help with bookkeeping - it helps you get organized and simplifies bookkeeping. Sage 50 Pro Accounting does that. It gives you the information you need to make more informed, more financially sound decisions - better decisions. Sage 50 Business Intelligence does that. Save time, money, and run your business better with Sage 50 Pro Accounting. Save time, money, and run your small business better with Sage 50 Pro Accounting.